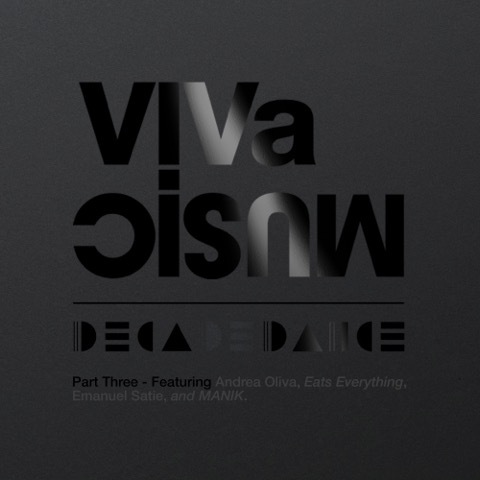 Today sees the third and final installment of VIVa MUSiC’s 10-year anniversary sampler featuring Eats Everything, Andrea Oliva, Emanuel Satie and MANIK. Arguably VIVa’s biggest release to date, ’10 Years of VIVa MUSiC: Decadedance’ has so far featured label boss Steve Lawler and the likes of Groove Armada, Mathew Jonson, Catz ‘n Dogz, Junior Sanchez and more. As it draws to a close Steve Lawler now welcomes four more artists to contribute to the series: Edible boss Eats Everything, Desolat producer and ANTS resident Andrea Oliva, Knee Deep In Sound’s Emanuel Satie and Ovum and Bpitch’s MANIK. Bristol’s Eats Everything delivers first with ‘Prog-Le-Matic’, displaying bouncy bass riffs that give way to pumping filtered atmospherics. Next, Swiss Andrea Oliva serves up punching kick drums alongside circling low-slung aesthetics with ‘Rider’ before Emanuel Satie’s ‘Zombie Love’ offers a display of rumbling low end enhanced by bubbling sound-design. Concluding the release, San Diego based producer MANIK’s ‘The Right Moves’ is a high intensity workout of 808s, brimming with piercing vocals samples and fervent percussion.